The origins and authorship of Le Morte d’Arthur are murky. There were numerous people who went by the name of Thomas Mallory around the time of the publication of the book. 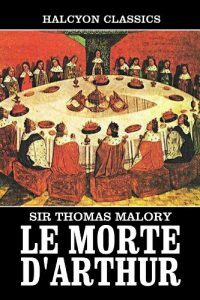 Scholars generally agree the author was one “Knyght presoner Thomas Malleorre” (“Sir Thomas Maleore” according to Caxton), born in 1416, who was the actual author of the book. The stories were not invented by Mallory. He compiled and translated them from a collection of stories originally published in French. A previously unknown copy of the original text was found in Winchester College in 1934. By headmaster W.F. Oakshot. This version was established as written by Mallory and included some substantial revisions to the known text. The revised version does not have the book and chapter divisions more commonly associated with the book. There are numerous re-tellings and modern translations of Mallory’s book. Alfred, Lord Tennyson published his Idylls of the King as a Victorian version of the famous cycle. The illustrator Aubrey Beardsley illustrated the text in 1893- 94. T.H. White’s The Once and Future King is one of the most famous modern versions of the story. Rather than a scene by scene re-telling of the tale, he told the story in the form of a novel. The stories inspired Mark Twain’s A Connecticut Yankee in King Arthur’s Court in which an American Yankee travels back in time to experience adventures in the court of King Arthur. The story has been made into the musical Camelot which was made into a movie. There are so many movies based either directly on Mallory’s book or on some part of the story that we cannot cover them all. Some more recent film versions include Excalibur from 1981, King Arthur from 2004, Disney’s The Sword and the Stone from 1963, and Monty Python and the Holy Grail, perhaps one of the most funny versions of the Arthurian legend.